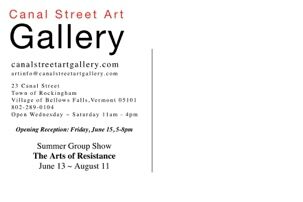 “The Arts of Resistance” is presented in collaboration with exhibitions at Project Space 9, curated by the Rockingham Arts and Museum Project (RAMP); Canal Street Art Gallery; 33 Bridge Street, all in Downtown Bellows Falls and Main Street Arts in the Village of Saxtons River. “The Arts of Resistance” is an exhibition of two and three dimensional visual art, installation, performance, poetry, song and music exploring art-making in the spectrum of social commentary and political action. The belief that artists are historically proven as intrinsic to the change and progression of culture and politics in ways spanning from contemplation to propaganda, is central to the works in the show. 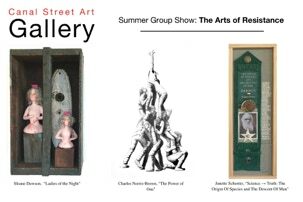 Canal Street Art Gallery is located at 23 Canal Street in the Historic Downtown of Bellows Falls in the Town of Rockingham, Vermont. 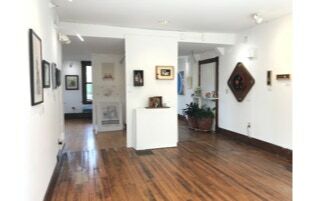 The Gallery is open Wednesday through Saturday from 11:00am to 4:00pm, and all other times by appointment.